Jazzpunk’s rapid-fire humour and surreal style make a great first impression, but unfortunately it quickly outwears its welcome. It’s a game about jokes above all else. Gameplay consists of simple first-person point-and-click adventuring, with a few basic puzzles – just enough to string the gags together. 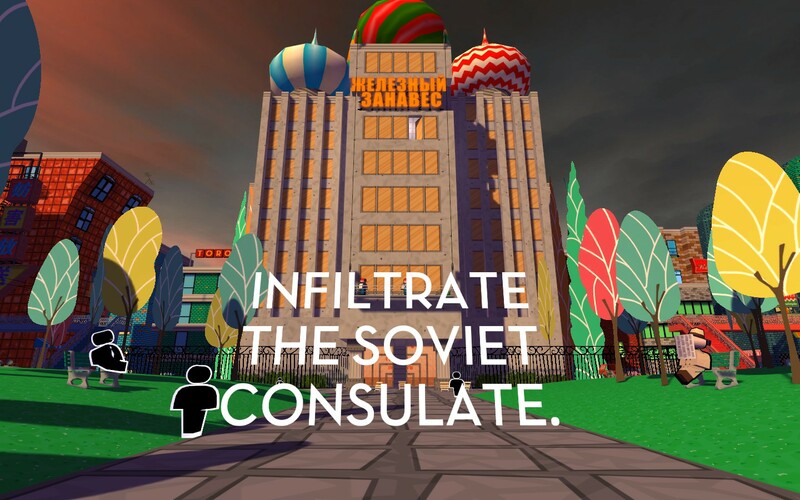 The plot is similarly thin – a series of Cold War espionage missions for a vaguely defined spy agency – serving mostly just to get you from one bizarre setpiece to the next. It puts a lot of weight on the gags, and unfortunately they just can’t bear it. They’re not bad jokes exactly, a lot of them are actually quite clever, but they’re just not good enough to serve as the be-all, end-all of the experience. 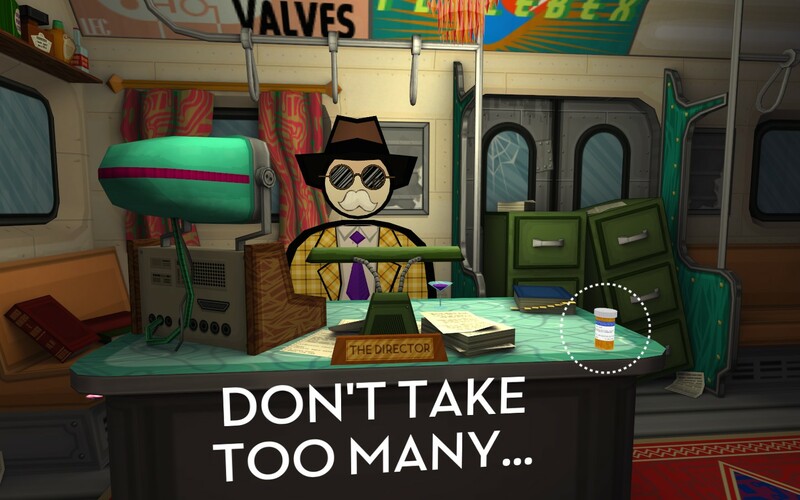 There’s something of a lack of confidence too – Jazzpunk is at its best when its speaking very much in its own voice, playing by its own logic, but too often it falls back on easy referential humour. It’s as if it doesn’t quite believe it can keep you chuckling without throwing in a few nods to classic video games and 90s TV shows. 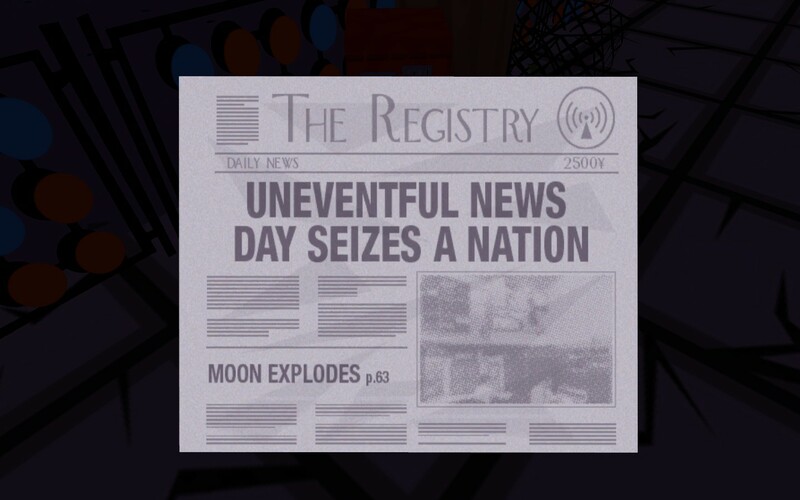 It’s a shame, because there’s a lot about Jazzpunk that is really interesting. The visuals are wonderfully inventive, a sort of deliberately garish, awkward aesthetic that’s at once totally engaging and faintly unsettling. Its look manages to do what its writing can’t – lend cohesiveness and consistency to an otherwise senseless world. Complimenting it perfectly is the music, upbeat but subtly pitched to put you on edge. Between these elements, and its hyper-exaggerated Cold War setting, Jazzpunk sets itself up perfectly to be something substantial and dark, without losing its comedy focus, but it just doesn’t come together. A recurring theme of virtual reality, and a seeming ambiguity about your perceptions as the player, at first had me excited that it would become some sort of black comedy about video games themselves (last year’s excellent The Stanley Parable being an example of how well this can be done), but it leads nowhere. Every gag is throw-away and quickly forgotten as it desperately throws something else at you – there’s no room for substance to develop. The running time is not long, maybe 2 hours at best, including side-activities and exploring. Without any kind of real plot or final punchline, its ending just feels like an arbitrary stop; here’s the point at which we ran out of jokes, goodnight. Even given the short duration, I was bored long before I was done. I really wanted to like Jazzpunk, but ultimately it’s just served as a reminder of quite how difficult a comedy game is to pull off. Jazzpunk is available now for £11.99 on Steam, for Windows PC, OS X and Linux.